A library named after Associate Professor Dr. Tran Trong Dang Dan has been inaugurated at the Ho Chi Minh City General Sciences Library on November 22. He donated over 10,000 documents, including researching works, valuable magazines and newspapers to the library. Associate Professor Dr. Tran Trong Dang Dan was born in 1936 in the central coastal province of Quang Tri. He joined revolutionarary forces in 1945 and started teaching and research, literary and cultural critical writing since 1960. In 1987, he gained a graduate degree in literary criticism from the USSR Academy of Sciences. He received a doctorate in philosophy and literature from UNESCO in 1996. The researcher owned more than 300 researching works, essays, critical writings, literary and stage works. Speaking at the ceremony, Head of the Department of Propaganda and Training of the HCMC Party Committee Than Thi Thu highly appreciated the Associate Professor’s collections and scientific researching works, and asked the Ho Chi Minh City General Sciences Library to manage the works effectively. 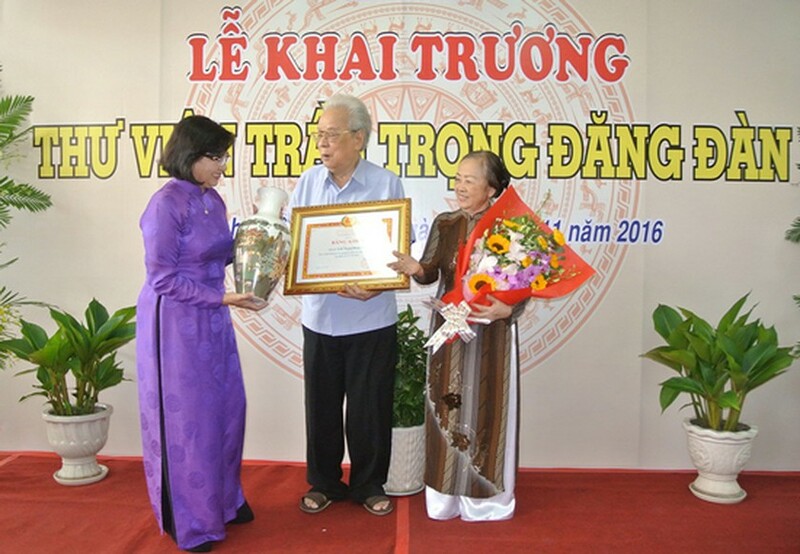 On the occasion, he was granted certificate of merit and Ho Chi Minh City Badge from the City’s Party Committee for his outstanding contribution to the development of culture and fine arts in the city.